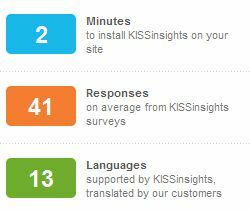 KISSinsights is a great way to know what your blog visitors think about your blog and what they want with the help of simple surveys. KISSinsights helps you to create surveys for your blog and its very simple and easy to add the surveys on your blog. All you have to do is ask your blog readers a question and they can see the survey slide up from the bottom right side of your blog. Creating an account is very simple and it hardly takes any time. Here are some of the stats that they have displayed on the home page. So, it hardly takes any time to add the survey on your blog and an average of 41 responses per survey is a very good number. Here is an example of the KISSinsights survey. Once you have created the account, you will see some code, which you have to add to your blog so that the surveys are visible on the blog. You will have to copy the code as seen in the above pic and then goto Blogger Dashboard, click on Design and in that section select Edit HTML. Now select the Expand Widget Templates option and search <body> and paste the code just below it. You can use KISSinsights on many blog platforms like Blogger, Wordpress, Tumblr etc. Now that you have added the code in the blog, click on Create a Survey and you will see a huge list of survey templates from which you can choose. With the free account, you can only select from the list of survey templates but even that is enough. However, if you want to create a custom survey, you will have to upgrade, which costs about 29$ per month. 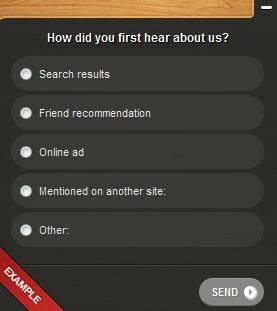 Once you have selected the survey, you can view information about it on the dashboard. However you will have to wait for about 2 hours for the survey to be visible on your blog. Once it is visible, you can check the stats about the survey on the dashboard. Here is a screenshot of the stats for the survey that I had put on this blog. Both the people who responded mentioned that they came to know about Cool Tricks N Tips via search engines. Using KISSinsights on your blogspot blog will tell you a lot about your blog visitors. We hope that you liked this post and that you try this on your blog. Hi Friends, I am Rahul Jadhav, the author of this blog. The sole purpose of starting Cool Tricks N Tips was to provide other bloggers with cool resources to create a better Blogger blog and also to share with them other awesome stuff from the internet.